A government-initiated project aims to integrate all the agencies needed to finish your business registration online. With all government paperwork and processing needed just to open a business, no wonder some aspiring entrepreneurs are already discouraged even before they start. A government-initiated project aims to change that by integrating all the agencies needed to finish your business registration. 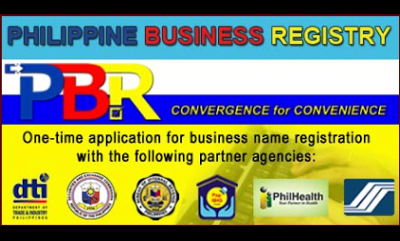 [related|post]The Philippines Business Registry (PBR) website makes it easier to transact with agencies such as the Department of Trade and Industry (DTI), Securities and Exchange Commission (SEC), Cooperative Development Authority (CDA), Bureau of Internal Revenue (BIR), Social Security System (SSS), Home Development Mutual Fund (Pag-IBIG), Philippine Health Insurance Corporation (PhilHealth), Local Government Units (LGUs) and other license-issuing agencies online anytime at your convenience. This is part of government efforts to curb corruption and reduce red tape. Each of the agency's computerized registration systems will be interlinked so that applicants need not physically go to each agency to register their businesses. For example, the BIR Portal now offers TIN Verification, eFPS (Electronic Filing and Payment System), eTIN (getting a TIN online), eBroadcasting, eForecasting, eSubstituted Filing, and eRegistration services. At present, sole proprietorships can already validate register their Business Names (BNs) from the DTI, get or validate their existing Tax Identification Numbers (TINs) from the BIR and employer registration numbers from the Social Security System (SSS), Philippine Health Insurance Corporation (PhilHealth) and Home Development Mutual Fund (Pag-IBIG Fund) through the PBR system. Entrepreneurs can log in the website anytime to register or head to DTI Offices with designated PBR kiosks or tellers and register through them. Application through a teller will involve submission of a filled up application form which may be downloaded from the website or completed and printed by the public online for submission. To download the needed forms for starting a business, click here.